Believe me, before taking on this project I didn’t know how to reupholster chairs either but if I can do it, you can do it! It all started when this past weekend I finally had a chance to get back to focusing on my Dining Room Makeover. The hubs didn’t even roll his eyes when out of nowhere I was painting the walls (which by the way, wasn’t even in the original plan! Even without the eye roll, I know he thinks I’m nuts…but totally supportive of my need to be creative. Love him. 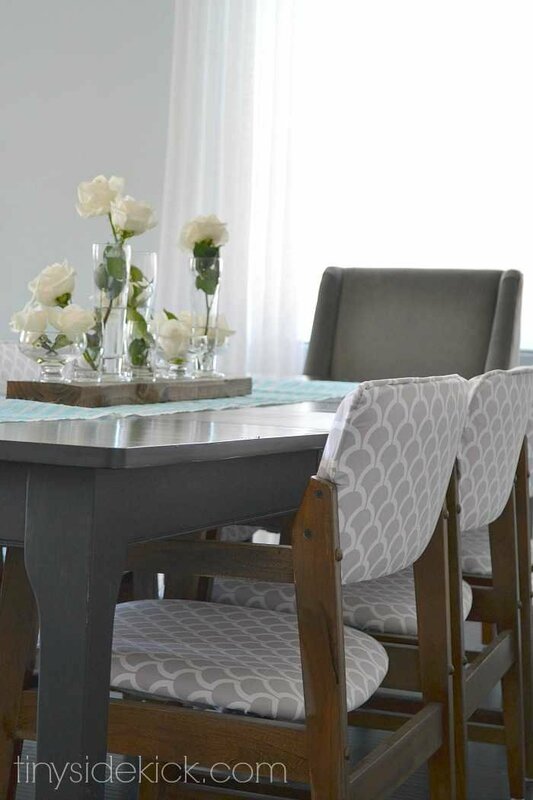 These reupholstered dining chairs were the first of the big projects on my to-do list. Wait until I explain what a score these were! I love the way they look and they are going to add to the collected look that I am striving for! I am a huge Craigslist junkie so when I was browsing one Saturday and saw these chairs for only 60 bucks (for all 6 of them) my hamsters started running at full speed! I had pinned a mid century dining chair that had almost these exact lines that I couldn’t get out of my head. And 10 dollars a chair! A no brainer! This post contains affiliate links for your convenience. Click here to read my full disclosure. First I had to take the chairs apart which, in this case, was pretty easy because the screws were in plain sight. I made note of how they came apart, because I would have to put them back together the same way, and labeled baggies to store my screws based on where they came from. I spent the afternoon, just my chair frames and I, in the backyard sanding (and scraping gum..so gross.) I used an electric sander and 100 grit sand paper to remove the old finish but keep the wood nice and smooth. Once that was done, I cleaned them using a damp towel and gave them a nice coat of stain. I used MinWax in Dark Walnut. I found this Michael Miller fabric on Fabric.com. I love this site because they have free shipping on orders over $35. You can check here for current coupons too! So it turns out that the gum situation on the wood frames was nothing in comparison to the yuck I found on the seat cushions. The previous owners of these chairs had invited some gum chewers with NO manners to dinner. It kept me quite entertained as I took out one staple after another. These chairs were covered in vinyl, which I decided to keep for the waterproof factor and because I didn’t want to have to get into replacing the cushions underneath. I used a flat head screwdriver to lift out the staples that held on the cardboard cover and to remove the piping, which I reused later. (**if a staple gets stuck, use a pair of pliers to yank it out.) Then, I gave each cushion a good cleaning with a paper towel and cleaner so they wouldn’t get the new fabric dirty. (**Before cutting decide which way you want your fabric to go on your finished product and be sure to check that it is going the right way before cutting each piece.) I laid each seat cushion on my fabric as a guide for where to cut. I cut about 3-4 inches away from the edge of each seat cushion and ironed out the wrinkles from the backside of the fabric. Then, I laid the seat cushion back onto my piece of fabric, print side down, (**double check the direction of the fabric again) folded one edge up and over and secured it using a staple gun in 3 places making sure not to secure it too close to the corners. I did the same thing on the opposite edge making sure to pull the fabric tight across the seat cushion. Then, repeated for the other 2 edges. 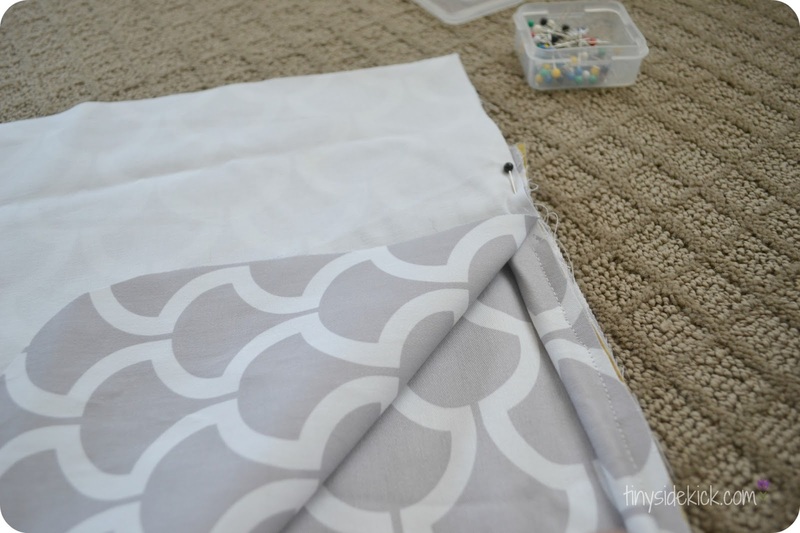 The corners are tricky because you don’t want to have any creases on the top of the cushion. Here is what worked for me. I pulled the corner up tightly and secured it with staples. Then I gathered a little bit of fabric at a time and moved it around until I only had creases on the underside of the cushion and stapled it in place. You will get the hang of this really quickly. When you are done the underside will look like a mess, but the top will be nice and clean! Seat cushion #1 done…5 to go! The seat backs required a little bit of sewing. I decided that I liked the piping detail on these and wanted to mimic the same thing so I had to come up with a pattern. Now, you should know that I am not a master seamstress. I have pretty much taught myself through trial and error, but hey, it seams seems to work! When it is pinned in place on 3 sides, double check to make sure it is taunt and smooth, then take the seat back out. Finally, I cut out the shape, using my pins as a guide, leaving about 1 inch for seam allowance. Label each side (I used “F” for Front and “B” for Back…I know, so sophisticated) so that you know which one is which, but also so you know which side will be facing out. This side will ultimately be the side with the print on it. I ended up reusing the piping that I took off of the seat cushions. I don’t have a picture, but I took off the vinyl that you see below and used the piping inside. I then measured out how long it needed to be by laying it along the existing piping on the seat backs and cut it to size. 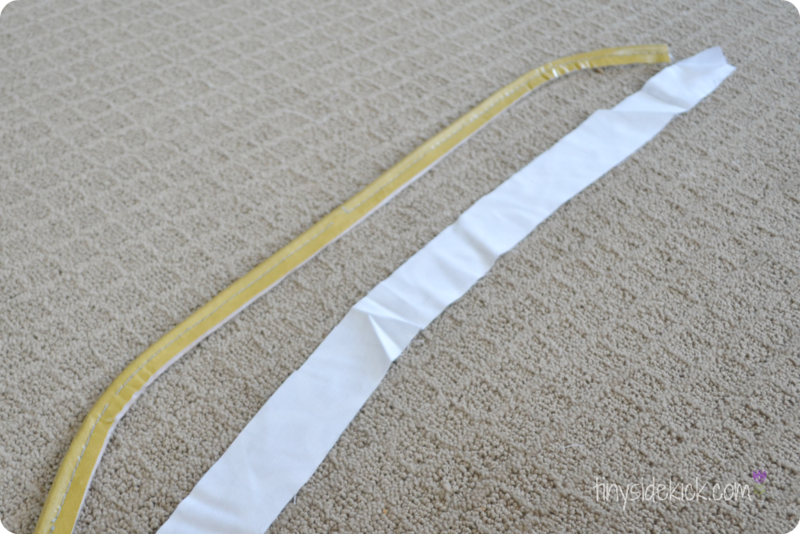 I cut a 2 inch wide strip of my fabric (be sure it goes in the direction you want) so that when I fold it over the piping I will have 1 inch on each side. This will also act as my seam guide later….I know, sometimes I impress myself…hahaha! Time to cut out some pretty fabric for my seat backs! So, lay out your fabric print side down paying attention to the direction of your print and how you want it to go. Then, lay your pattern piece face down also (your “F” or “B” will be face down) and cut right along the pattern. I don’t bother pinning it together, but you could if you wanted to. Repeat with the other piece of your pattern again paying attention to the direction of your pattern. Sorry I keep repeating this, but it is so important! 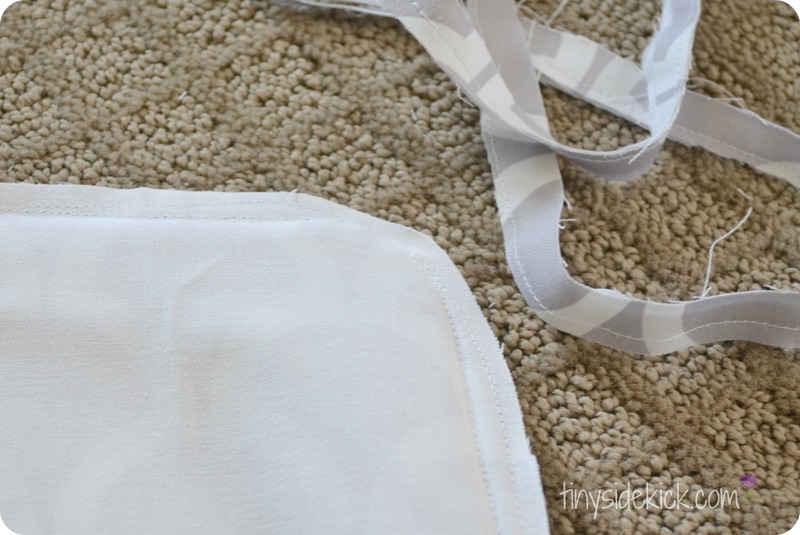 Fold back the edge of your top piece of fabric and lay your piping in place. Remember how you cut 2 inch wide strips? 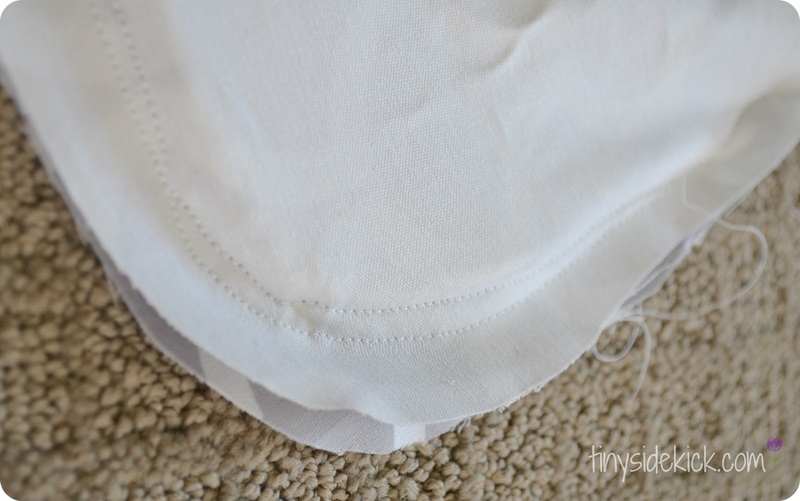 Well now you can simply line up the edge of the piping (folded over it is 1 inch) along the sides of the fabric and you will have your sewing line too! The rounded part of the piping will go inward as shown. Pin all the way around, making sure that you line up the edges. Now you are ready to sew them together! So using the piping as your 1 inch seam guide sew away! I used a zipper foot so that I could get as close as possible to the piping. In fact, I realized that I had to run each seat back through the machine twice (see the picture? The inner stitch is my second round.) The second time I was able to get much closer to the piping. You want your piping to be tight for the best look. 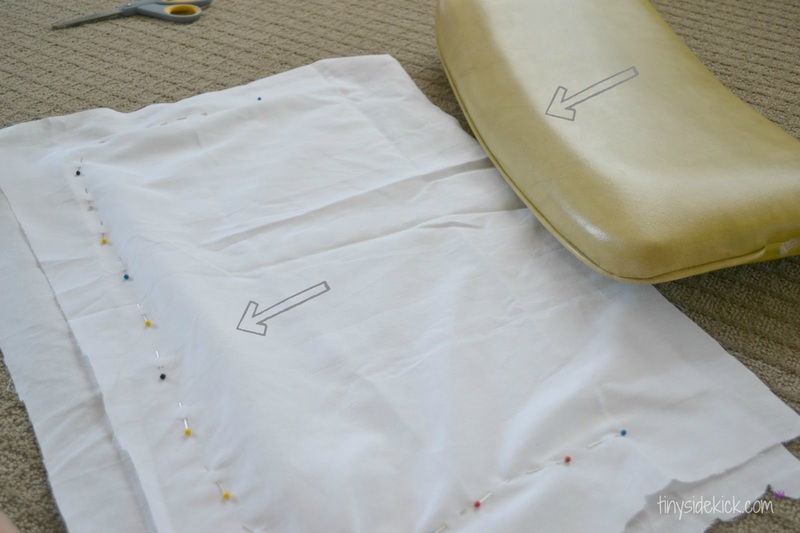 You can cut off some of the excess fabric so that it doesn’t make your chair look lumpy. Almost there! After turning the cover right side out, I put it on the seat back and adjusted it so that the piping was in the right spot and then to finish it off I used a staple gun. I pulled the fabric tight down the front side and secured it with a staple then did the corners sort of like I was wrapping a present. For the last seam I folded it under before stapling it so that it had a finished look. When I finished all of this, it was time for the big moment…putting them back together! I’ll be honest, this project was a biggie…but so worth it! Between mommyhood, and life, and some other projects, I had to work in stages but the end result was sooooo worth it! I mean common’ where could you find dining chairs for about 20 bucks each? I.love.them. Hi there. 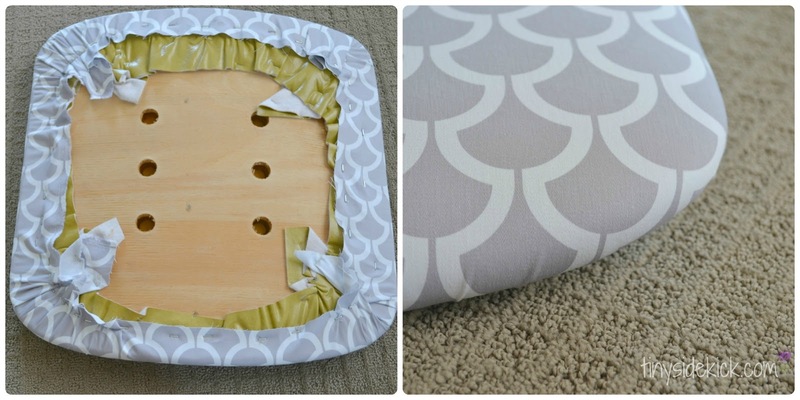 Did you use just a manual staple gun to secure the new upholstery fabric? or a air compressor w/ pneumatic staple gun attachment?? Also, Is it ok to upholster around the previous fabric for BOTH the seat AND the back??? I am aftraid to see what is under the seat…..
Yep I used a regular staple gun, Jojo. You can totally reupholster right over the existing fabric depending on the weight of the fabric you’re using. If you can see through it you may want to add a white or dark solid between so you can’t see the original fabric. Have a great day! I like how you mentioned that reupholstering can require some sewing. My mom is researching how to reupholster her couch. I appreciate the information on how to reupholster a chair. Quick question. 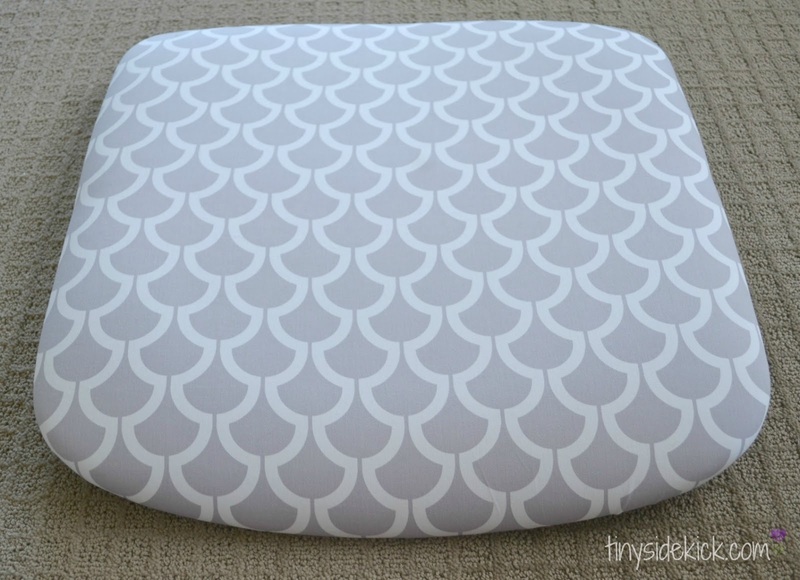 What did you use to cover the back of your seat cushion besides the fabric to give it shape? It look beautiful by the way! Hi Cicely. I actually didn’t use anything. I covered over the top of the existing vinyl so they already had that shape, but I supposed some firm foam cut to the right shape would work. Thanks Corey! That’s about what I had figured, but wanted to make sure. These look great! I scored almost the exact same chairs on craigslist! I was wondering how much fabric you bought in total? I have 5 chairs I need to do, and I have no idea how much fabric I need to order! Thanks! Hi Jenny. I ordered way too much fabric, but I think that you should be able to do 2 chairs with 1 yard. Measure the seat and back and add it up. A lot will also depend on the width of the fabric you choose. I would order just a little extra for mistakes too. Hope that helps! These are awesome! I’ve been eying some MCM chairs for a dining room redo myself. Thanks for the tips. I love that you left the vinyl on. Makes so much sense. Ha! Leaving the vinyl on was partly so that they would be smooth and partly because I was afraid of what I might find if I took it off. Second hand furniture can be scary! 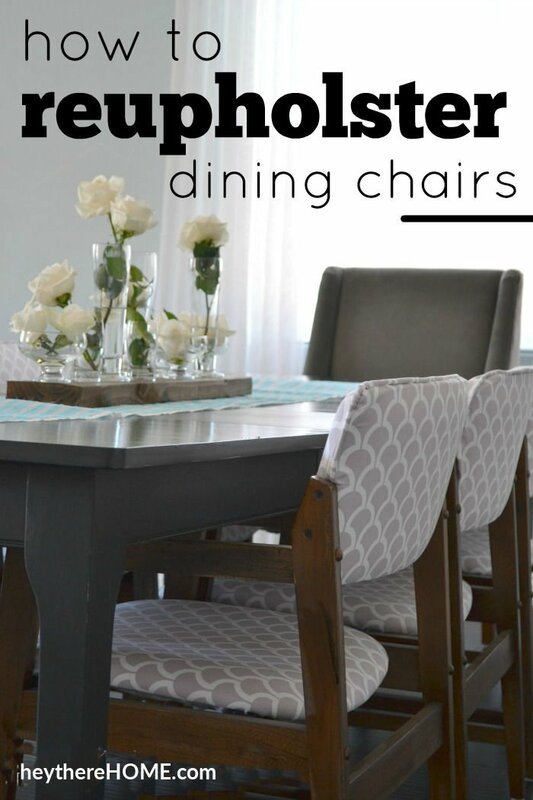 I love how your chairs turned out and great instructions too. This is a great idea, turning old things into something new and having an awesome result. Thank you for sharing this one. Love the new look of those chairs. Reupholstering can be so intimidating but is usually easier than it looks. You did a fantastic job! I just emailed you directly. If you don’t see it, check your junk folder. Thanks for the info. I am recovering two mid century chairs. Funny thing is I’m removing the new fabric someone put on with a yellows green vinyl like your before picture! HI there-I have very similar chairs (only 2 though…). I love your fabric. What is it?? Hi! The fabric is Michael Miller Bekko Home Decor Billow Slate. I bought it on Fabric.com. I actually have a lot of extra so if you are interested in my selling you a couple yards (for less than what they sell it for) email me and we can work it out! It is a really pretty fabric. Great transformation! You really modernized these chairs! Thanks for sharing at this week’s Throwback Thursday party. I’m in love with your chairs! What a great job! I know all about the eye rolling! Thanks for sharing at Throwback Thursday! Thanks so much Alli! Love that I found the link up so I can share some of my older posts! I’ll be back next week. You scored big time with those chairs Corey! I love their vintage look, and the fabric you choose really compliments them. I bet they’re super comfy too! Stopping by via Throwback Thursday and happy to meet you! Okay – you make this look WAY too easy! Love it girl – super cute! Great job! I have a few chairs (more than I would like to admit) sitting in my work room waiting for me to learn to reupholster! You did a great job on those chairs! Love the fabric and color choice!! You did an amazing job on this! It doesn’t even look like the same chair! Come link up with us at Craft Frenzy Friday tomorrow at http://www.craftdictator.com!! Such a great tutorial! I adore the fabric you chose. Now, I need to find a set of chairs to recover! Wow!! They look great! I love that fabric! Wonderful makeover! Kudos to you and your project—I don’t think I’d have the patience for all those chairs! Love the fabric too. It complements the angles of the chair frames quite nicely.